For an Organization its Data is the most important thing, and the Org’s IT department takes lot of measures to make sure data does not fall in wrong hands. The DBA’s and Application programmers setup different layers of security on top of data so that the user is only able to see the Filtered data/rows from a table that he has access to. DB programmers normally create abstracted Views or Stored Procedures with complex logic on top of the Tables by using other master-mapping tables that contains the user-data access key. Sometimes these security logics are not upto the standards, and may have various versions on a database and thus it becomes difficult to track, update and make them fail-proof. 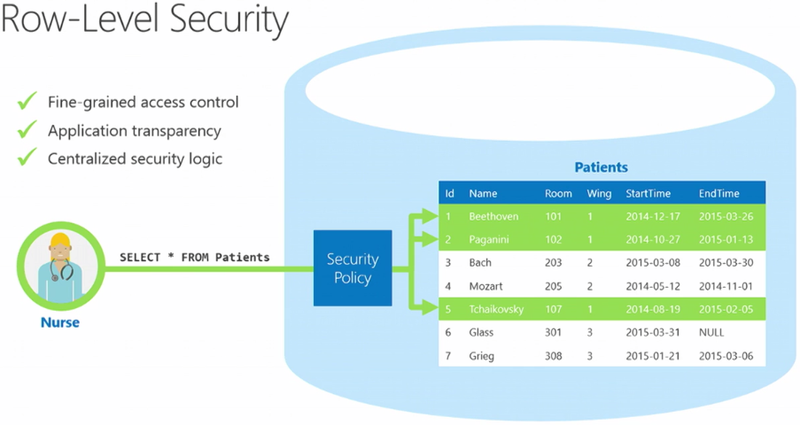 So, with SQL Server 2016 the new Row Level Security feature is going to handle this Out of the Box and as a Standard. RLS or Row Level Security is a feature that enables fine grained control over access to rows in a table, allowing you to easily control which users can access which data with complete transparency to the application. With this feature rows are filtered based on the Execution Context of the Query, rather than the current user access rights. A secure logic can be created to determine which user can see which rows and restrict any kind of data (rows) by designing a flexible and robust Security policy for a table. 1. Create Users and Grant Read/SELECT access for a Particular table. 2. Create a new Inline Table-Valued Function that will contain the Filter Predicate for that table. This Function Predicate can be a sophisticated business logic with multiple JOINs or a simple WHERE ManagerCode = ‘userHR’. 3. Create a new Security Policy for this table and add the above Function (Filter) Predicate to it. Please note: that these Functions & Security Policies should be unique for a table. So to create RLS for an another table, you will need to create separate Function & Security Policy. 1. The CEO, over-all admin of the company data. –> Create a sample table [dbo]. [Employee]: with a self-referencing Manager ID column. As a normal SEELCT and without RLS, it just ignores my Execution Context and execute the Query and return all the 8 rows. The above method is prone to issues, like SQL Injection and any other user can apply other user’s User-Name and get the information that he is not allowed to see. With this type of method you have to apply another security layer at the application level so whenever a user executes the SP it gets executed with the same user’s User-Name. – and there is no need to apply the WHERE clause filter for the User-Name. This makes the security system more reliable and robust by reducing the surface area of your security system. WITH (STATE = ON); -- The state must be set to ON to enable the policy. The above Security Policy takes the Filter Predicate Logic from the associated Function and applies it to the Query as a WHERE clause. The simple “SELECT *” statement will fetch me zero rows after applying RLS, as my user ID is not configured to have access to any of those rows & Table. 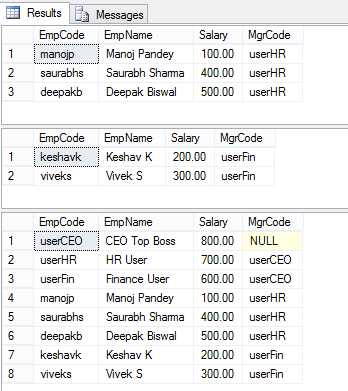 – The HR & Finance users got just 3 & 2 rows, respectively. – But the admin CEO user got all the 8 rows. –> Thus, by using RLS Filter Predicate feature in SQL Server 2016 you can create your own customized Security by creating an Inline Table-Valued Function that is linked to the Security Policy for your Table. –> Check Block Predicates with RLS in my [next post, Part 2]. Great Article, How can we achieve row level security for multiple users? For multiple users you will have to use a security group having all similar users in that group. This mentions the recommendations that RLS be implemented thru a new schema. Could you update to accommodate best practice? Thank you sir. I am a systems architect studying for 70-473. This is one of the topics of the exam. Since I do not have any DBA experience, it took me some time to understand this from the Microsoft documentation but it definitely got VERY clear after reading this in your site. Congratulations and thanks for people like you that makes other people’s life easier because the effort they put while sharing knowledge. Keep the hard work ! I can achieve the same by using View. So my question is why we are going to use row level security ? Please refer the below query for your reference . One Question Manoj. What is the performance impact of doing this? Well regarding perf I didn’t not see any improvement nor any significant degradation. But I think there would be scope of pref-issues depending on how you are going to query the data. This is definitely one of the very well written article with example on RLS. Thanks for taking time to write this. There is a small typo which needs correction. Within the Stored Proc -dbo.uspGetEmployeeDetail, please make the table name as employees on line no. 6. It was throwing an error saying employee table doesn’t exist. Thanks Suhas, for pointing it out. corrected !!! Great article, very well explained, lucid. A new feature to take away.